SANTA MONICA, CA, UNITED STATES, November 2, 2018 /EINPresswire.com/ -- Recruiting for Good launched L.A's Funnest cause 'helping moms fund summer camp.' The staffing agency will reward referrals made by professionals that lead to someone getting hired; with donations to help fund summer camp scholarships and Fun Maui Trips to Party at the best Food and Wine Festivals. 3. Recruiting for Good donates $1000 to a summer camp scholarship; and rewards one Fun Trip to Party in Maui. Reward includes: 2 round-trip flights from LA to Maui, 3 Night Hotel Luxury Stay in Wailea, and 2 festival tickets (Kapalua Wine and Food or Maui Film Festival). Recruiting for Good is only rewarding 25 trips in 2019, must sign up by no later than January 31, 2019. Email Carlos@RecruitingforGood.com to get started. Carlos Cymerman adds, "You don't have be a mom or a dad to help kids...just awesome....For women who love to make a difference and Enjoy Luxury Travel, our Beauty Foodie Maui Trips are perfect for sharing with best friends or significant others. One of my favorite nonprofits and camps; that I love to help fund is Girls Who Code. Join Recruiting for Good to help fund their cause." Recruiting for Good is a socially progressive staffing company in Santa Monica, finding talented professionals awesome jobs, since 1998. Companies retain us to find the best talent in Accounting, Finance, Engineering,Information Technology, Marketing, and Sales professionals. We reward referrals with fun life experiences. 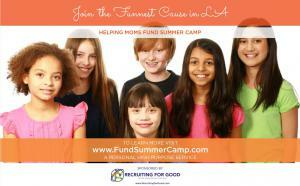 We launched L.A.'s funnest cause "Helping Moms Fund Summer Camp, www.FundSummerCamp.com and help sponsor www.OurMomsWork.org.